policy | Stop Dog Whistle Racism! The highest-ranking black congressman questioned Thursday whether South Carolina’s governor was “playing the race card” when he compared using federal stimulus money to Zimbabwe and other nations that printed cash in tough economic times. Gov. Mark Sanford wrote a letter to President Barack Obama on Thursday asking for a waiver to spend $700 million in stimulus money to pay down some of the state’s debt — a day after comparing the package to other countries that dealt with hard times ineptly. Sanford has been an outspoken critic of the stimulus but hasn’t outright refused any of the money. Rep. Jim Clyburn, D-S.C., has already lambasted Sanford and other governors who said they may not take some of the stimulus money, calling such a move a “slap in the face of African-Americans” last month. Thursday brought renewed sparring, as Clyburn criticized Sanford for mentioning Zimbabwe. Penn is following Schoen’s lead in making the Democratic side of this Establishment argument – using the manufactured storyline of Bill Clinton’s supposed actions to claim that if a President Obama governs as a progressive, he will end up like Clinton in 1994. Not only is the storylinewholly fake, it implies that nothing has changed in America since 1994. That is, it implies with a straight face that the Bush years and the backlash to those years did nothing to move the country in a progressive direction. Give all of these hacks credit. Out of their hysterical fear of waking up to irrelevancy on November 5th has come a disciplined strategy of lying – lying about where polling data shows the country is on issues, and lying about what an election of Obama actually means in such an ideologically polarized context. That was “a huge admission,” said Linda Chavez, the chairwoman of the Center for Equal Opportunity and another anti-affirmative action crusader. Chavez is also supporting McCain, but she said Obama is more likely than her candidate to shift the debate on race in her direction, and possibly even end race-based affirmative action policies. Partisans of both sides of the bitter, long-running wars over affirmative action say Obama’s position on the subject is ambiguous, and scarcely articulated. His campaign did not respond to repeated requests to make a policy adviser available to discuss the issue. My response: I concur with Mr. Sowell on affirmative action. However, I tackle the issue from the standpoint of black competence and self-esteem – my black nationalist side raises an eyebrow when it is explicitly or implicitly argued that standards have to be lowered for blacks – while Mr. Sowell is concerned about color-blind merit. I disagree with him on gay marriage though. And yes, the law should also allow polygamy. If a man wants to marry a woman, a man, two women, two men, or a man and a woman, how is that the business of government or other people if everyone consents to the arrangement? Pedophilia involves children, so consenting adults are not the issue there. Pictures of an Hispanic man flashing a gang symbol, another Hispanic man in the custody of immigration officials, and an Hispanic male in a kitchen with a rifle adorn the lastest race-bating mailer sent out by ex-state representative Bill Keffer (R-Dallas) in his grudge match against State Rep. Allen Vaught (D-Dallas). 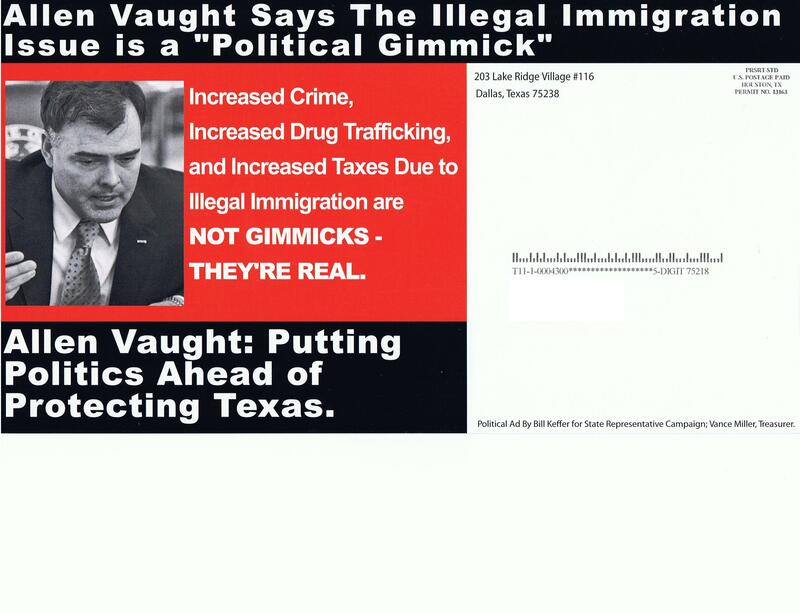 The mailer, which was paid for by Keffer’s campaign, alleges that Vaught says the illegal immigration issue is a “political gimmick,” but cites no source to illustrate that Vaught ever made any such statement. Politico: Affirmative action change under Obama? Affirmative action change under Obama? Among the California voters suffused with hope at the prospect of the election of Barack Obama is one Ward Connerly. The election of the first black president would inevitably alter views of race in America. The campaign itself, in which Obama has played better in lily-white Montana than in diverse South Carolina, has revealed a complex picture. Should Obama move into the White House, it would further change the country’s conversation about race, though not necessarily in predictable ways. A black president from a troubled big city could turn new attention to the problem of race or make the political choice to take his black support for granted; his own race may convince some of the benefits of diversity while others would take it as proof that racism is so far in the past as to no longer needs remedies. Affirmative action has not been on the agenda of either presidential campaign, and while it’s been a hot issue at times on the national stage, it’s not a necessary feature of the White House agenda. Educational policy is conducted largely at the state and local level, and broader economic woes have pushed the battle, and most other socially charged issues, into the background. But experts say that President Bush’s additions to the Supreme Court could come down harder against race-based affirmative action then previous courts had, and a conservative group’s recent lawsuit against the University of Texas could force that question during the next president’s term. And Connerly is one of several opponents of race-based affirmative action who say they think Obama is far more likely than Senator John McCain to abolish, or profoundly alter, that system. Their hopes are founded on Obama’s remarks that well-off black children don’t need the program—something that he, unlike most Democrats with a national profile, could say without rebuke, because he was referring to his own daughters.